With this organ we are bringing one of the most important german organs in the french romatic style to Hauptwerk. This sample set is as downloadable files (appr. 18 GB). The full version of the sample set requires a lience key issued by Milan Digital Audio LLC, the owner and producer of the Hauptwerk software. Without this licence update you will only be able to install and run the trial version of this sample set. Please have a look at the "trial version" page for more details and links to the download files. The booklet describing the sample set can be viewed here. The booklet is included with the set as PDF (to be viewed directly from Hauptwerk). A free trial version of this set is available as well. 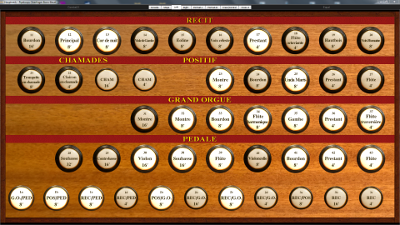 With the trial version you also get to play with the full ressources of the organ, but in this case the periodic silence is activated whenever more than five stops are drawn. For the full version a dongle licence upgrade is required in order to install and load the organ definition files. This sample set come with two distinct voicings: One is the voicing of the original organ, the other one ("symphonic") is modified to strictly follow the principles of Cavaillé-Coll. The two voicings provide a distinct sound and character to the sample set. Switching between voicings is done by reloading the organ with the corresponding definition file. The organ of the St. Joseph church in Bonn-Beuel, built in 1981 by the reputed firm Gebr. Oberlinger, is very special in the german organ scene. At that time the german 'Orgelbewegung', oriented at a north-german baroque sound ideal and originating from the 1920s, could still be felt everywhere. Romantic organs were seen as the product of a period in organ building mainly formed by decadence. Many precious instruments of this period had been destroyed or totally defaced in an attempt to reach a more baroque sound, so that not much was left from their original sound. In that time it took a lot of courage to build an organ following a romantic organ design ideal, and even more so french romatic. At that time the organ at St. Joseph was a small instrument built by Klais in 1903. This instrument had been modernized in the 1950s according to the prevailling taste of that period. The pneumatic action had been replaced by an electric one, and mixtures and high pitched aliquote stops had been added to the disposition to brighten the sound. But the resulting sound was not really baroque as intended, instead it was sharp and at times rather piercing. In a journal Hans Peter Reiners, organist at St. Joseph, found an ad in which the swiss parish of La-Chaux-de-Fonds was offering their organ for sale. This 20-stop instrument was built in 1882 by Kuhn and, despite some minor damage, was still in excellent condition. This organ, together with nine stops kept from the old Klais organ, should now form the basis for the new instrument. The contract was awarded to the reputed firm Gebr. Oberlinger, located in Windesheim. In 1981 the new instrument was dedicated, which then comprised 58 stops. Today the instrument has 61 stops, distributed over three manuals and pedal. The disposition and tonal design follows closely the tradition of Aristide Cavaillé-Coll, the most famous organ builder of the french romantic period, which also is reflected in the design of the organ console. The drawbars for the stops are arranged in semi-circles at the height of the corresponding keyboards on both sides of the console. Following the french tradi­tion the foundation stops (32', 16', 8', and 4') are placed on the left hand side, and the higher pitched stops (aliquotes, mixtures, and also reeds) are placed on the right hand side. 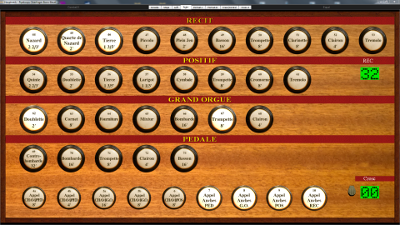 The large number of 8' stops in all divisions, voiced to blend well with the others, forms the basis of the organ sound in St. Joseph, which gets its characteristic tonal colour from the large number of reed stops typical for french romantic organs. With six reed stops alone the Récit (3rd manual) contains particularly many reeds. At the same time this division also contains stops allowing for the finest dynamic nuances, here we find the Cor de Nuit, the Voix céleste, and also the Eoline, a very narrowly scaled string stop. The Positif division offers a wealth of possibilities with its disposition with three foundation stops, two 8' reeds (Cromorne and Trompette) and a number of aliquotes. With this flexible disposition and also its location as the second manual it takes up a mediator role between the Grand-Orgue and the Récit. With its complete series of principal stops based on the 16' Montre the Grand-Orgue builds the backbone of the organ sound, which is reinforced by a powerful trumpet chorus. The pedal finally makes up the sonic foundation of the instrument. With its versatile disposition it can serve as an adequate partner for each individual division as well as the full organ. Following a suggestion by Pierre Cochereau in 1983 two horizontal trumpets (Chamades) were added to the organ. These can be coupled to the Grand-Orgue, Positif and Pedal. 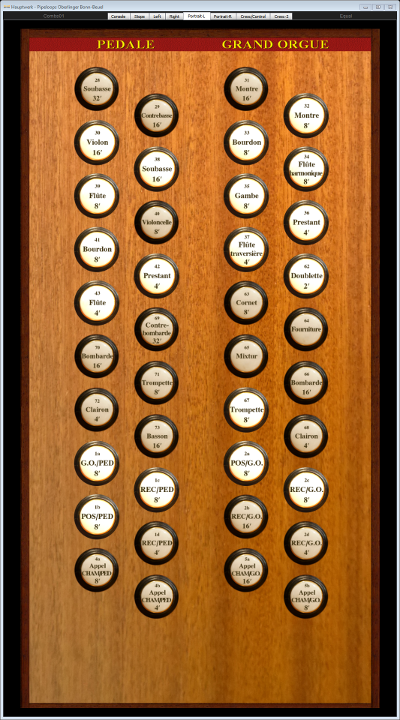 The names of the organists playing concerts at St. Joseph give a feeling for the renommee and the reputation the organ has gained throughout Europe: Artists such as Olivier Latry, Ben van Oosten or Jean Guillou are taking turns. Comments given by french organists about this instrument speak for themselves: Pierre Cochereau wrote into the guestbook "A grand instrument and joy beyond comparison". Michel Estellet-Brun conceded: "What a lesson for France! To find an organ here, such as they have destroyed in France!" The organ was recorded in 2009 using high end microphones in four-channels. For an optimal result each pipe was recorded separately with at least two release layers (staccato and long notes). The blower sound was also recorded, stop and keyboard action noises however have been omitted, since these are barely audible above the blower noise in the nave. The recordings have been done in 24bit/96kHz without any analogue filtering. All sample processing steps were performed with our in house developed sample processing tools. Our new custom denoising algorithm is optimized for the charac­teristics of pipe organ samples resulting in a previously unknown quality of the denoising without effecting the pipe speech characteristics. The sample set provides a virtual copy of the instrument with all its original registration aids for the Hauptwerk software. The only extensions compared to the original are extending the manual compass to c'''' and pedal compass to g', and creating the possibility to play the Chamades from a separate fourth manual. The crescendo can be reprogrammed freely by the user, a special screen page is provided for this in the user interface. The crescendo is operating "blind", i.e. it does not visibly move the stops. The console page is not intended to be used to control the sample set. 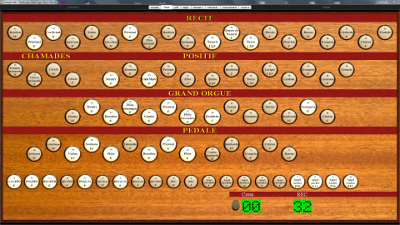 Instead, it is meant to give the organist an impression of the real console. 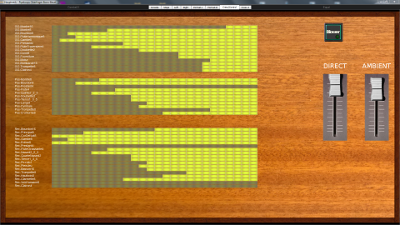 A photograph of the console has been overlaid with animated drawstops. Due to the angle of the image and the image resolution it is not possible however to read the stop names. This page contains all elements except for the keyboards and pedal. The design of this page is such that good readability and touchscreen usability is provided. This page is intended to be used when a single touchscreen is available to control the sample set. The arrangement of the drawbars on screen follows the arrangement on the original console. These additional pages are intended to be used with two touchscreens. They show the same elements as the main page split into a left and a right hand page. These pages provide the best usability due to the larger size of the control elements. The arrangement of the drawbars again matches that of the original console. For users with two touchscreens mounted in vertical orientation special screen pages have been designed. For these pages the original arrangement of the stops did not appear to be very practical, and hence the stops have been reordered following the typical design found in anglo-american organ consoles: The stops of each division are organized in vertically oriented groups, keeping all stops of a division on the same side of the console. This page shows the programming of the crescendo and allows to modify it. One simply clicks on the corresponding field in the programming matrix to set or reset it, thereby activating or deactivating the stop for that crescendo stage or combination. The settings can be stored in a Hauptwerk CombinationFile. In addition two sliders are provided to control the mix between the front (direct) and the rear (ambient) channels. This is mainly intended for two-channel audio setups, allowing to add additional ambient sound to the main channels. 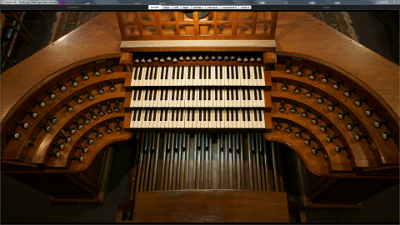 For best results the organ should be used with an audio system with at least four channels, allowing the front and rear signals to be routed to separate audio channels. The compression used by Hauptwerk when loading samples is lossless, i.e. loading samples compressed does not result in any loss of quality. It results however in an increase in CPU load of about 15% during playing. The best quality is obtained when loading the samples in 24-bit resolution, loading in 16-bit will cause a small but noticeable loss of quality. Since these options can be selected for each stop separately it is possible to indi­vi­dually adjust the options to match the available RAM. Approximately 30 GB of free space is required on the harddisc to install the sample set. §1) This agreement defines the licencing agreement between Pipeloops Reiner Suikat and the user of the sample set of the Gebr. Oberlinger organ in Bonn-Beuel. The sample set consists of the samples, images, database, and other files. §4) The customer may use the sample set for non-commercial public performances. The customer must mention the use of the sample set in the program notes. Commercial recordings and permanent installations in public venues using this sample set are only allowed with written permission by Pipeloops. Here you can find some recordings performed by various artists to demonstrate the sound and the versatility of this sampleset. Most recordings are available in different versions: Direct channels alone, Direct and Ambient mixed (direct at 100%, ambient at 80%), both of these as mp3 and uncompressed wav-file, plus a 5.1 flac compressed audio file (center channel is left empty, LFE channel with lowpass set at 150Hz). This allows to even listen to the demos with a surround audio setup, getting an even better impression of the sound of this organ. The first set of recordings has been performed by Christoph Keller. Here is another set of fine performances by Anton Doornhein. Pipeloops has always placed great emphasis on enabling customers to thoroughly evaluate our sample sets before a purchase decision. We are still the only company giving the customer full access to all samples and functions of our sample sets before actually buying it. With the organ of St. Joseph we are again taking the evaluation options one step further: For the first time it is now possible to test the set with all stops, but with the periodic muting of the sound known from our other sample sets, but also to play with a small number of stops without any interruption for as long as you like. As long as not more than five stops are drawn, the interrupt timer is disabled and you an play continuously. As soon as you draw more than five stops, the periodic muting of the sound is switched on. This gives you the best evaluation options currently available for any sample set that we know of. Since this sample set is licenced via a dongle update, we are also able to offer a full 14 days money back guarantee. Hence, even after you purchased the set, you can still decide to return it and get a full refund. There is however a small fee for the dongle updates. This sample set is delivered as downloadable files (appr. 18 GB). Detailed installation instructions for your Hauptwerk version are given in the Hauptwerk Main User Guide. This can be called up from Hauptwerk at any time via the Help­ menu. During the installation a dialog will appear displaying the licence agreement for this sample set. You must accept this agreement in order to continue with the installation. The full version of the sample set requires a lience key issued by Milan Digital Audio LLC, the owner and producer of the Hauptwerk software. The dealer you purchased the sample set from will organize the necessary steps. You will receive a mail shortly after your purchase with all information required to get and install the key on your system. Without this licence update you will only be able to install and run the trial version of this sample set. During the installation process of the first packet (disc-1) Hauptwerk will offer you three components to install: [data] contains the samples etc., and the two [organ]-components contain the definition files for the trial and the full version. Without the licence key you will only be able to install the trial version. If you want to install the full version after your purchase and you already have the trial version installed, you should NOT un-install the trial version. If you do so, Hauptwerk will remove all your configuration and voicing data for this organ. You can download the full product from the four links provided below. As mentioned above only the trial version can be installed without the dongle update. Once you purchase the set you will only need to install the full organ definition file. The special features of the trial version are explained above.